I'm focusing now on The Patch where most of the veggie growing happens - I plant a few things in the wardrobe garden and throughout the rest of the garden, but The Patch is the most intensive. The Patch and The Workroom will make up my Studio, and I'm hoping that there will be some "cross pollination" across the two areas. The Patch is fenced against my dogs who like to dig, chase rats and eat tomatoes! 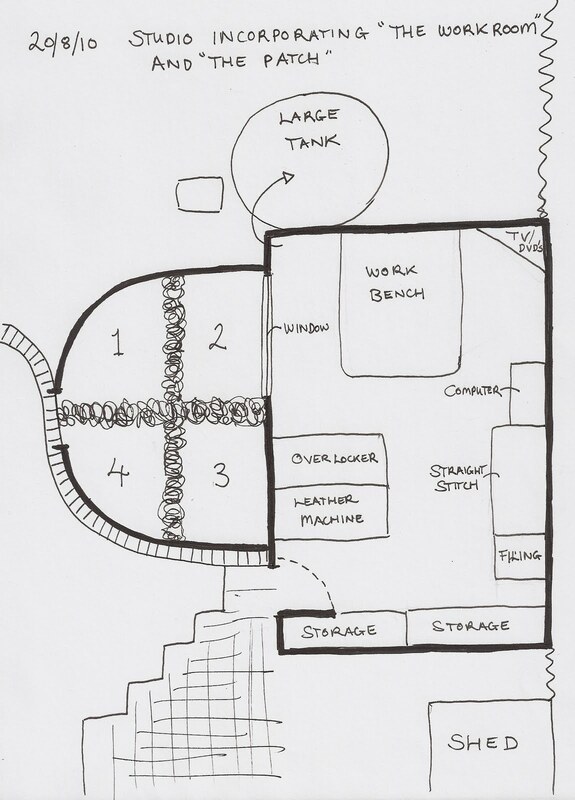 I have it roughly divided into 4 quarters with a mulch path as a divider, which gets replenished when required. 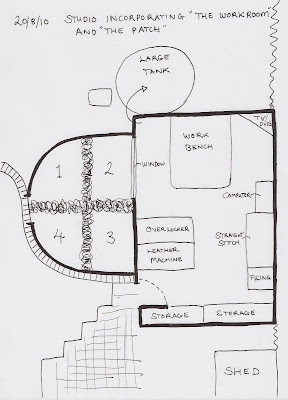 Last year I put in a drip water system which is connected to the water pump and 2,250L tank which gathers water from The Workroom roof - so there is a nice synergy between the two areas already . It needs some repair - I think the dogs pulled the drip line apart in one corner trying to stick their heads through the mesh fence. I need to put up some finer gauge mesh too - Gemma has jumped through the fence on one occasion that I witnessed when there was a rat in The Patch! These 3 pics are the views of The Patch from the gate/opening back towards the workroom, and across beds 3 and 2, then across beds 4 and 1. These are the views which I will continue to take pics from as the work progresses. Hugo likes to run in there when the gate is open! Last Thursday/Friday I cleaned up 3 of the four quarters of the rampant self sown parsley and replenished the path - a bit of revival and reshaping happening. The 3 pics are the same views as above after the tidy up. There's some new artichoke plants sprouting in bed 1 (artichoke is a perennial - dies down in autumn, re sprouts in late winter). More about the artichoke later. The weeds and parsley are left on the surface of the soil as a green mulch and will break down quickly when the warmer weather comes and add to the organic matter. Nothing is wasted in The Patch, all remnants are useful. 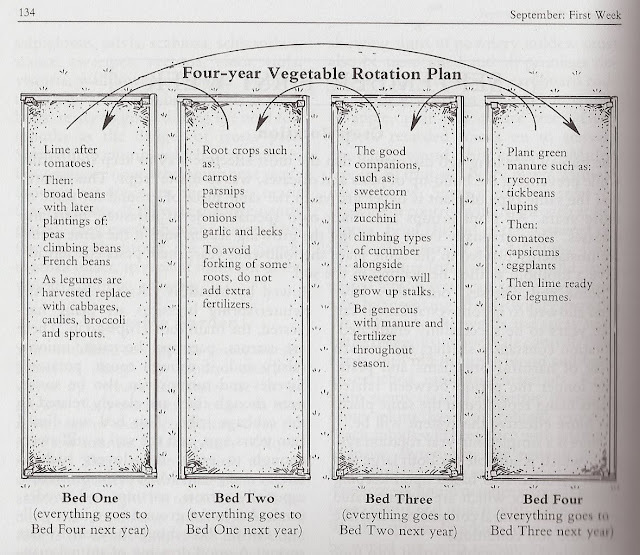 The quarters are numbered from 1 - 4 as I am going to practice crop rotation according to Peter Cundall's gardening book (Cundall, P 2007, The practical Australian gardener : seasonal tasks using sensible organic methods, Penguin Books, Camberwell, Vic.). They are numbered according to the chart from the book. I have been doing this for 1 year, so this season the numbers will move in an anti clock wise direction, 4 will become 1, 1 will be 2, 2 will be 3, and 3 will be 4. I get a bit confused and have to keep looking back at the book! The first year was pretty unorganised though and it was only beds 3 and 4 that I really stuck to with some tomatoes, cucumbers and zucchini's. The artichoke that I mentioned earlier was a problem as it grows too big in that spot, and I didn't relocate it in time last year - it needs to be moved asap before it starts it's spring burst of growth. 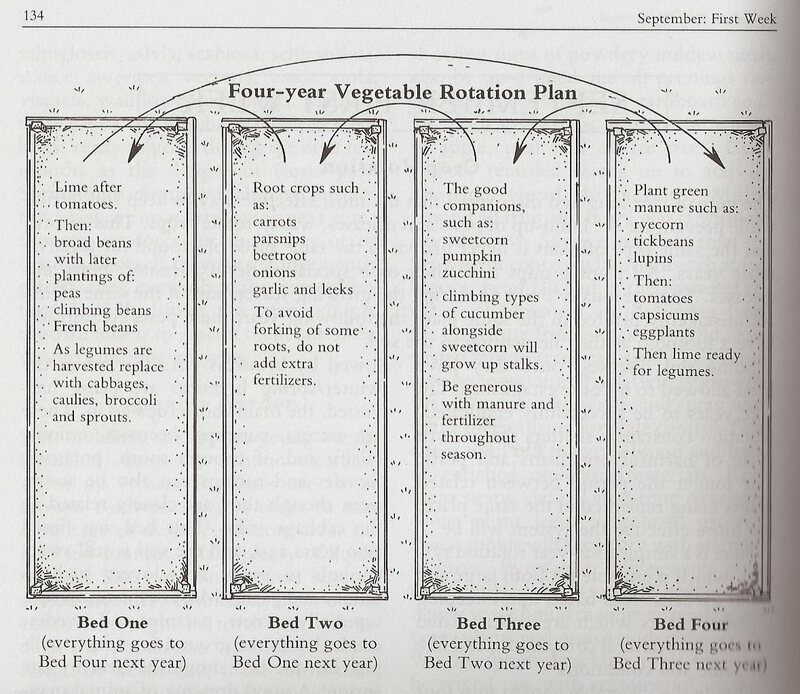 Crop rotation is based on the idea that certain groups of plants like similar conditions, and that they leave beneficial things behind for the next group. It is a perfect demonstration of gleaning remnants!